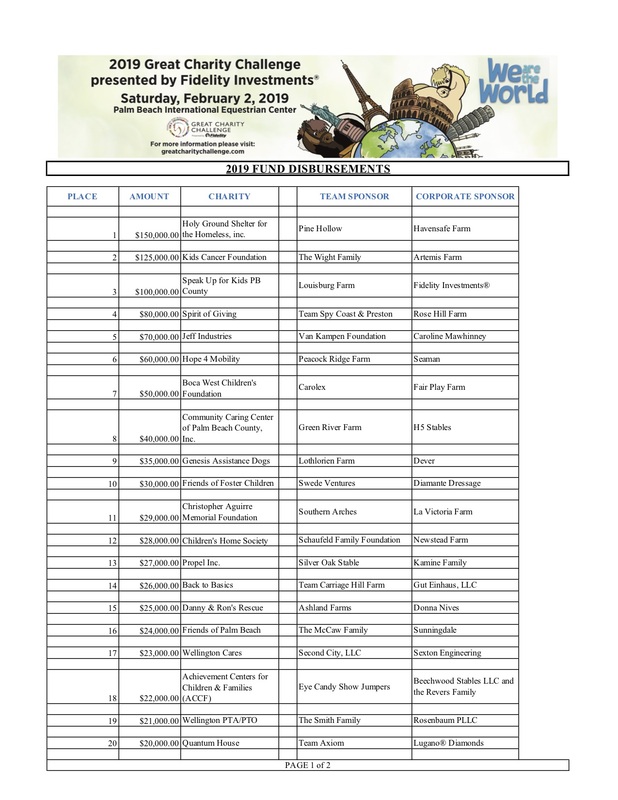 We were so thrilled to be chosen for the 2019 Great Charity Challenge on February 2nd, 2019! Lindsay Brock for Jennifer Wood Media, Inc.
Wellington, FL – February 2, 2019 – The “Saturday Night Lights” of the 12-week Winter Equestrian Festival (WEF) beamed on Palm Beach County Charities during the 10th Annual Great Charity Challenge, presented by Fidelity Investments® (GCC), on Saturday, February 2. 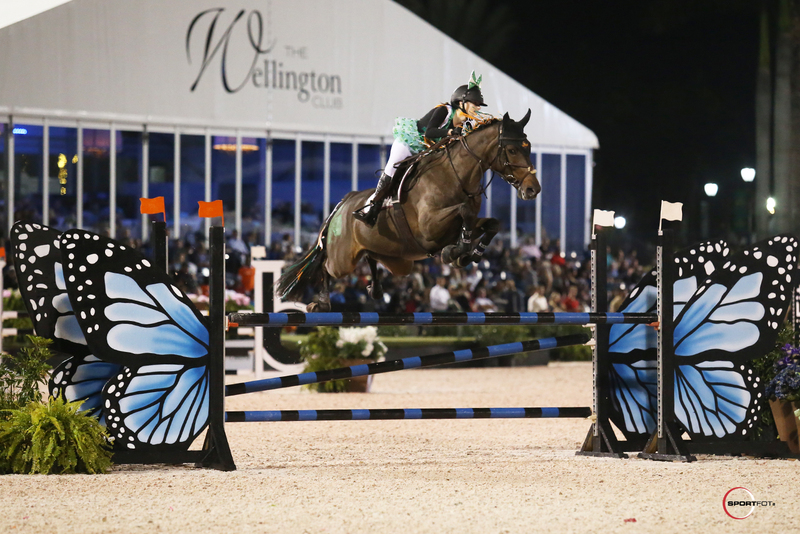 Holy Ground Shelter for the Homeless took home $150,000 as the lion’s share of the $1.3 million in prize money on offer after their team of riders David Blake, Carly Dvorkin, and Madelyn Ruskin, along with team sponsor Pine Hollow and corporate sponsor Havensafe Farm, took the victory. 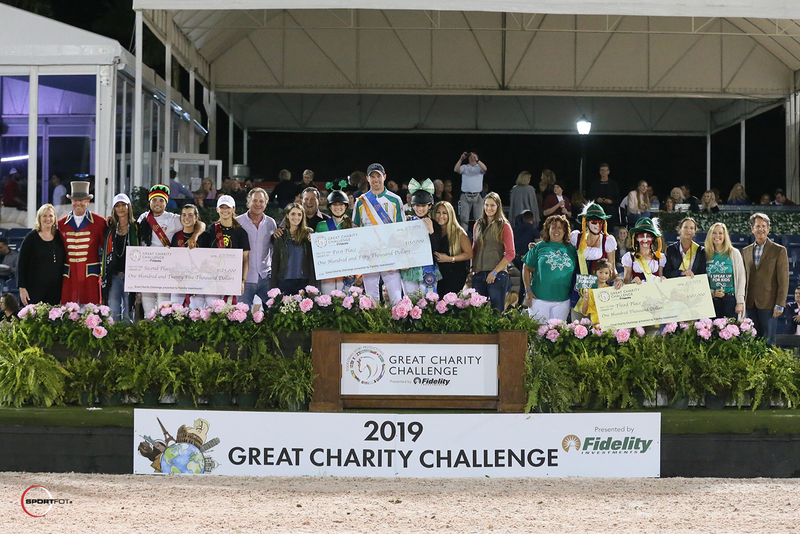 The top three teams, along with their charity and team sponsor representatives, for the 2019 Great Charity Challenge, presented by Fidelity Investments®. Photo © Sportfot. In total, 26 pro-am combinations were paired with randomly selected Palm Beach County charities. Each team consisted of junior and amateur riders competing side-by-side with top professionals, including several Olympians. “We Are The World” was the theme of the night with riders, charities, local families, and horse sport fans coming dressed in support of their favorite nation. 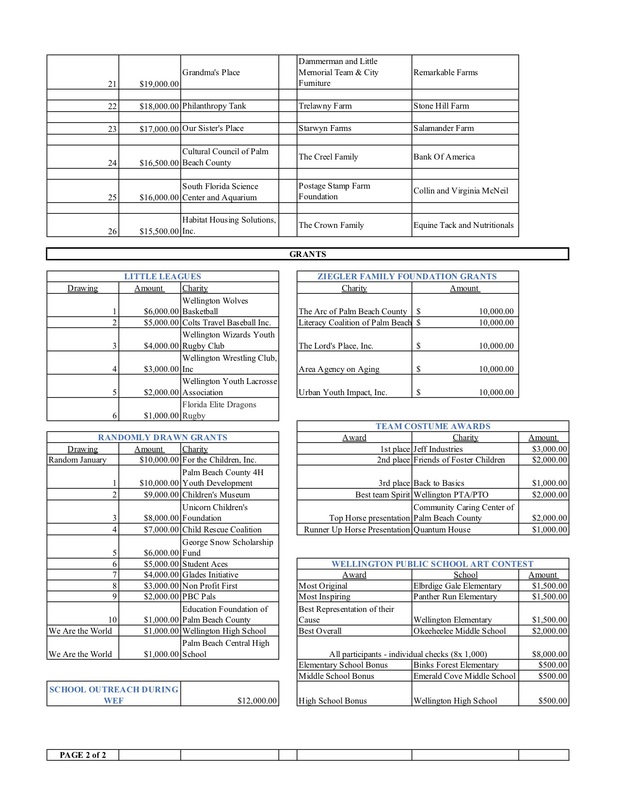 In total, the evening’s contributions brought the overall Great Charity Challenge tally to $13.5 million distributed to more than 230 well-deserving Palm Beach County charities over the last 10 years. 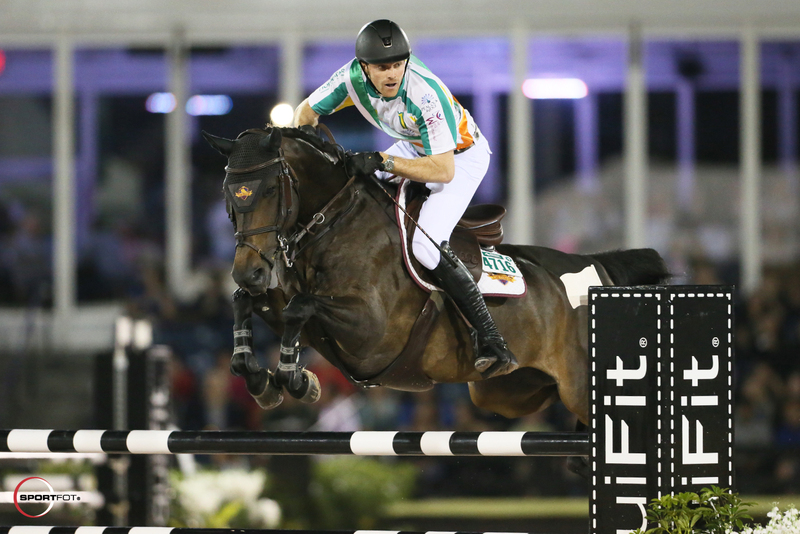 “All of us with Fidelity Investments® here in Palm Beach County are delighted to be involved with the Winter Equestrian Festival and with the Great Charity Challenge, a wonderful event that helps so many charities in Palm Beach County,” said Heath Odom, Manager of Fidelity’s Investor Center in Palm Beach Gardens. Madelyn Ruskin aboard Abazu BSM, Carly Dvorkin on Carlotta 168, and David Blake riding Emilia made up the top trio of riders, presented by team sponsor Pine Hollow and corporate sponsor Havensafe Farm. They produced three perfect rides on the relay-style course to finish on a final time of 91.904 seconds. The winning charity, Holy Ground Shelter for the Homeless, shelters and mentors homeless, pregnant, and parenting young girls and their children ages 17 to 23. “I can’t even begin to put into words what this means to us,” said Phyllis Turner Jepson, Executive Director of Holy Ground Shelter for the Homeless. “This is life-changing, and it means that several lives will be changed because of this money. They did such an amazing job for us and I told them earlier when I met them that I had a really good feeling, but this is a better feeling! We’re in shock and just so deeply, deeply grateful. Team sponsor Pine Hollow has been involved with the Great Charity Challenge since its inception and watched their team finish second in 2018 before jumping to victory this year. Click here to watch the winning team round! Blake trains Carly Dvorkin, who shares a special dedication to the event with the rest of her family, include father Howard and mother Gwen. 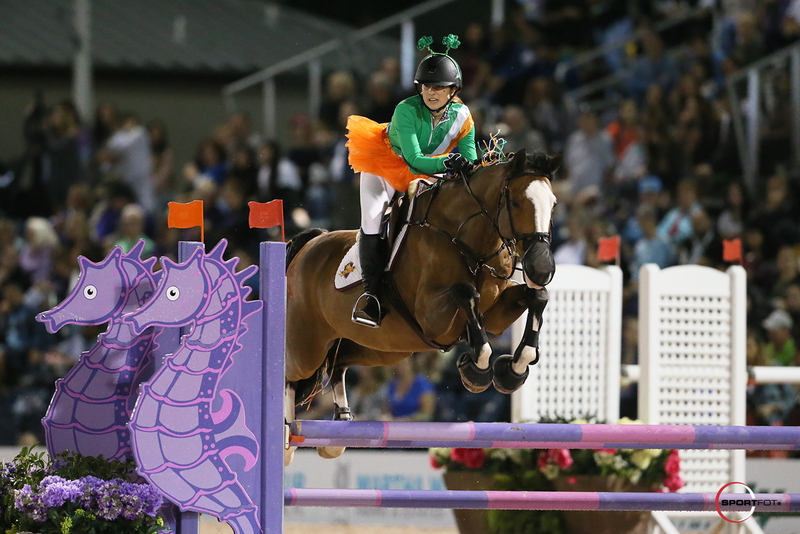 Riders Katherine Barnard, Samantha Wight, and Daniel Bluman were just a single second shy of the win in 92.817 seconds, but second place still delivered $125,000 to their charity, the Kids Cancer Foundation. The runner-up team was supported by team sponsor The Wight Family and corporate sponsor Artemis Farm. The third place team, made up of Claire Schreder, Coco Fath, and Molly Ashe, jumped for Speak Up For Kids Palm Beach County and won the charity $100,000 with a time of 94.046 seconds. Their team sponsor was Louisburg Farm and corporate sponsor Fidelity Investments®. All of the participating charities in the 2019 Great Charity Challenge, presented by Fidelity Investments®. Photo © Lois Spatz. 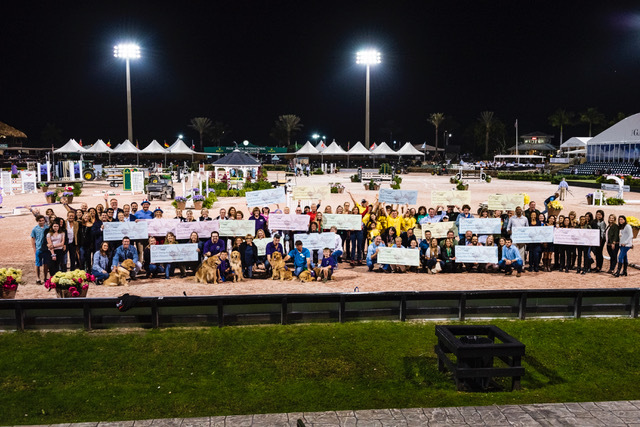 All 26 charities selected for the Great Charity Challenge received a share of prize money on a sliding scale at the conclusion of the evening with the smallest amount totaling $15,500. Fidelity’s mission is to inspire better futures and deliver better outcomes for the customers and businesses we serve. With assets under administration of $7.1 trillion, including managed assets of $2.5 trillion as of November 30, 2018, we focus on meeting the unique needs of a diverse set of customers: helping more than 28 million people invest their own life savings, 23,000 businesses manage employee benefit programs, as well as providing more than 13,000 financial advisory firms with investment and technology solutions to invest their own clients’ money. Privately held for 70 years, Fidelity employs more than 40,000 associates who are focused on the long-term success of our customers. For more information about Fidelity Investments, visit https://www.fidelity.com/about.